A. Lewis Ward has more than 30 years of experience preparing, reviewing and litigating business contracts. If you’re seeking counsel in the area of business contract law, call (713) 961-5555 or e-mail today. Agreements in business contract law are oral contracts or written contracts. 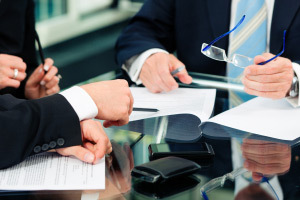 Our first responsibility as attorneys is to educate and guide our clients in understanding the benefits as well as the dangers of entering into either oral or written contracts. A verbal agreement, or a “business deal made with a handshake,” is a wonderful idea, but when disputes arise it is difficult to determine the truth between “he said” and “she said.” It can become very difficult and expensive to establish the terms of an oral contract after the fact. A. Lewis Ward & Associates believes in protecting our clients’ businesses with knowledge, strategy, and integrity. We are known for doing what’s necessary, and then some, to help make sure our clients’ business is safe from fraud and that contractual parties adhere to what they have agreed to do. In order to establish any type of contract, certain requirements must be met. When agreeing to a contract both parties must be legally competent and able (instances of legal incompetence/inability include intoxication or mental impairment). Both parties must sufficiently consider all terms and conditions of the agreement. Finally, there must be a meeting of the minds. This happens by the process of offer and acceptance, both of which may be accomplished through words or actions. Of course, we’ll need to know your situation and your interests in order to best assist you and your business with any form of contract. Guidelines are just that — guidelines. Contact A. Lewis Ward & Associates for assistance with business contract law by calling (713) 961-5555 or e-mail.